How to force Wine into acting like 32-bit Windows on 64-bit Ubuntu? When installing Wine on 64-bit Ubuntu 12.04, both 64-bit support and 32-bit support get installed. If I run wine foo.exe where foo.exe is a 64-bit-aware installer, it thinks it's on 64-bit Windows. This would be fine if this mode didn't fail, but in my case, it does (yet the Wine database suggests the app I'm trying to install should work, presumably as a 32-bit app). How do I tell Wine (and Winetricks) to use Wine in 32-bit-only mode? Install playonlinux there you will have this option. It is a frontend to wine, and makes it far better. This picture was taken on a 12.04 - 64bit system. Is have a 32 bit wine version , like said before. 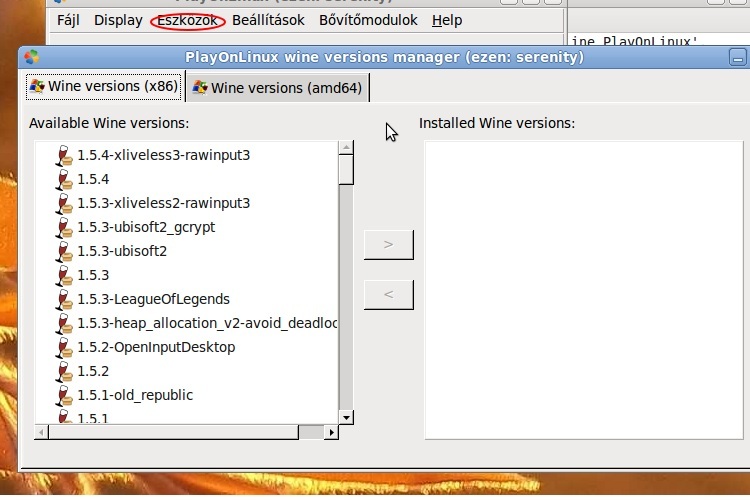 You can run 32-bit Windows programmes on a 64-bit Linux machine with wine by installing playonlinux. If you haven't done so before, install playonlinux: sudo apt install playonlinux. Start the playonlinux GUI: playonlinux &. Click "Install a program" in the left sidebar. Click "Install a non-listed program". If this is the first time you started playonlinux, you might have to click through two notification windows. Click "Next", then select "Install a program in a new virtual drive"
Choose a name for your new virtual drive, preferably the name of the Windows program you want to install. Leave all checkboxes unchecked on the next screen and click "Next". Select "32 bits windows installation" and click "Next". Click "Browse" to select the installation file of the program you want to install and follow the instructions of the installer. Assume you already made a run of making .wine with 64bit compatibility. If not you are still able to make a folder called .wine instead in your home directory. Then copy all content of prefix32 found in your home directory to your .wine content area both files and directories, first either backup or just remove the content in the directory .wine if you already are planning running 32bit arch of wine, don't overwrite content! Rather delete if you already made a backup. Remember that directory .wine might be hidden, any use of seeing hidden files will make you be able to see the folder in your home directory. You can as well use the Go in Thunar with Ubuntu to either just go straight into the folder called .wine in the home directory and make the process as told here before. While you can not run within the same containers you can actually still have both by setting up Biarch. Please see this Wine white paper on setup. While hsivonen gives you the easiest answer this would be the way to achieve your desired functionality. Not the answer you're looking for? Browse other questions tagged 64-bit wine or ask your own question. Wine on Ubuntu 16.04: 32 and/or 64 bit? How do I install iTunes? Hearthstone stucks on black screen, Intel gpu issue? How do I get around OS checks in wine? Install python in wine - configuring paths from winetricks? How to fix Sketchup in Wine when tool starts, but displays empty workspace? How to install Dotnet 45 on Ubuntu?